The Prolimatech Megahalems has minimal air resistance between fins delivering powerful cooling performance in both overclocking and quiet cooling applications. 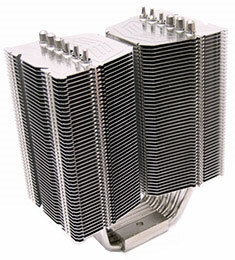 The heatpipes are arranged in a straight line to prevent air backdraft which contribute to a better flow through the heatsink. This, coupled with a mathematically calculated thickness for the optimal air-to-surface ratio, turns the Megahalems into one of the best performing heatsinks to date. Compatible with Intel 775, 1156 and 1366. Fan not included. Please note - there should be no need to lap the heatsink base, and doing so will void warranty: "Every Prolimatech's heatsink base is designed on a pin-point scale of how the base is to be flat and/or curved where it's needed to be. We have programed our machines to machine the surface in a very calculated way. Any after-manufacture lapping or modding done to the base will alter the design, hence negating its performance factor as well as its warranty." Top fin made of scratch-resistant Stainless Steel to preserve shine. Minimal air resistance between fins allowing best balance between noise and performance in range of 800-1200RPM. For all out performance, fan RPM at 1600 or above is recommended. Heatpipes are lined up in a straight line to prevent air back draft allowing air to easily pass through the heatsink body. Wide gaps between fins with mathematically calculated thickness to maximize best air-to-surface cooling rate. Easy-to-install retention mechanism for LGA 775, 1366, and 1156. Includes easy-to-apply high grade thermal compound, a perfect sidekick to all Prolimatech heatsinks. New Universal Backplate to support all Intel platforms. Two sets of fan clips for a duo-fan installation.